Warning: In winter time Stages 1 and 2 could prove a little taxing because of the wet ground. The present Inn at Whitewell was in former times the Manor. In medieval times it acted as the Court House where Forest tenants and Forest keepers met to decide local issues. In more recent times a market used to be held in the forecourt of the house. The Inn is now a hotel and popular meeting place for drinks and meals. "Forest" from the Old French "foris" meaning land for hunting game was first declared such by the Norman, Robert de Lacy. 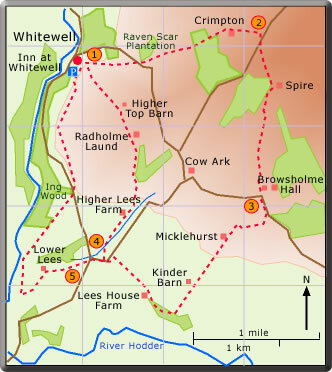 Red and fallow deer were hunted in the Forest where Radholme Laund was a deer enclosure. The park keepers of old became the Parkers now of Browsholme Hall. 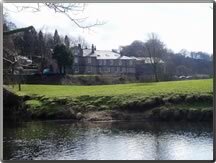 As well as the local history, the present walk takes in some spectacular scenery and the enjoyable Inn at Whitewell.